Canadian Business Executive wrote a feature article on our company in their summer issue. Read the article below. 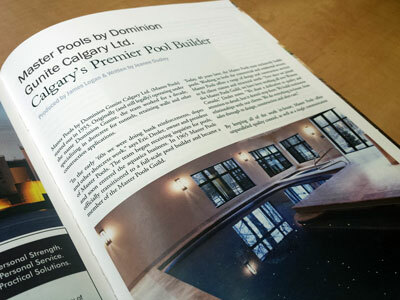 Master Pools by Dominion Gunite Calgary Ltd. (MPDG) started out in 1955, not building pools at all. Originally (and still legally) operating under the name Dominion Gunite, the team worked for a decade, specializing in shotcrete for tunnels, retaining walls and other construction applications. “In the early ‘60s, we were doing bank reinforcements, slopes and other shotcrete work,” says Eric Drolet, owner and president of MPDG. The team began receiving inquiries for pools, and soon entered the aquatics business. In 1965, MPDG officially transitioned to a full-scale pool builder and became a member of the Master Pools Guild. Today the business exclusively builds pools. Working in both the commercial and residential sectors, MPDG offers a range of design and construction services to fit client visions and structural needs. “Ever since we joined the Master Pools Guild, we have been working over a majority of the country,” Drolet notes. “We share a dedication to quality and attention to detail, but it doesn’t stop there. We build continuous relationships with our clients. We do everything in-house. We employ designers and engineers; we do our own sales and construction.” By keeping all of the work in-house, MPDG offers unparalleled quality control, as well as a single communication point. Everyone on the team is on the same page, making it easier to exchange feedback and information with customers. MPDG does not produce absolutely everything in-house, and Drolet notes that his relationships with suppliers are strong. “We work with Pentair for many of our products,” he says. “Another supplier we use is cover star, which seals the pool to the point that you can walk across it. It is totally child safe.” Water Fun and MPDG’s service departments are growing steadily. The features division sells outside of the business, ramping up margins. MPDG continues to grow, offering leading products and services to clients across Canada. Drolet and his crew offer unparalleled experience as well as unusual in-house resources to keep prices low and control quality. Master Pools By Dominion Gunite Calgarywill continue to expand, offering unusual products for the pool industry that give clients and their customers hours of entertainment in safe, attractive settings.